Containerized cargo handling at the Port of Oakland is about to get a whole lot cleaner. The Port said Tuesday that its largest marine terminal is converting 13 diesel-powered yard cranes to hybrid power. The result is expected to be an annual 45-ton reduction in diesel-related air pollutants. 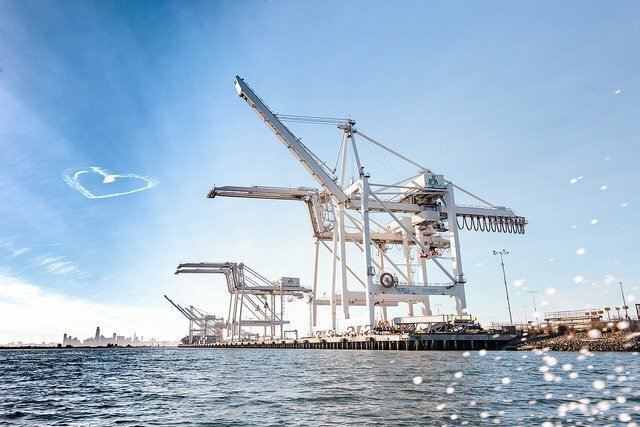 The Port said the first hybrid crane began service March 5 at Oakland International Container Terminal. It added that the rest of the terminal’s retrofitted fleet will come online by next year. Each crane, shaped like an inverted U on wheels, is being equipped with batteries and new, smaller diesel backup engines. In July 2018, the Bay Area Air Quality Management District awarded the terminal operator, SSA Terminals, a $5 million grant for the hybrid project through its Community Health Protection Grant Program. SSA Terminals is spending about $1 million more to retrofit its cranes. According to the Port, the terminal operator could recoup its cost within two years, thanks to fuel savings. Terminals are where ships are loaded and unloaded and where containerized cargo is delivered to customers by truck or rail. The massive cranes, known as Rubber Tired Gantry Cranes, are the workhorses of port operations worldwide. They straddle mile-long rows of containers, lifting boxes on and off trucks and have a 50-ton lift capacity.